I was drawing a dog in a swimming pool but the pool kinda turned out like an oval. I suddenly thought that I should make it a hamburger with fries. I was so into the drawing that I was really upset when my mom told me to stop to practice my hebrew. My bat-mitzvah is coming up and I had to practice. But every time my mom was talking I would add or change something on my drawing. She got mad at me but it was worth it! I think my drawing actually turned out really well. It was my 1st hamburger drawing and I thought since most people draw animals, I thought that I should draw something unique and different. I HOPE YOU LIKE IT!!!! Like it..no I LOVE IY!! I <3 your artwork! There's not the right letters to put into words how much I love your artwork/site. Great job! 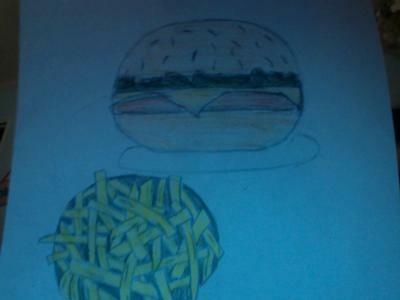 I'm hungry even looking at it looks so real.lol.Its awesome couldn't have done better my self. :) my dear, i like this hamburger with fries :) ...and your story is perfectly cute :) i like how the pool turned out to be a hamburger :) GOOD JOB ! ! !